Craftsman 18 Ounce Flex Claw Hammer Just $19.99! 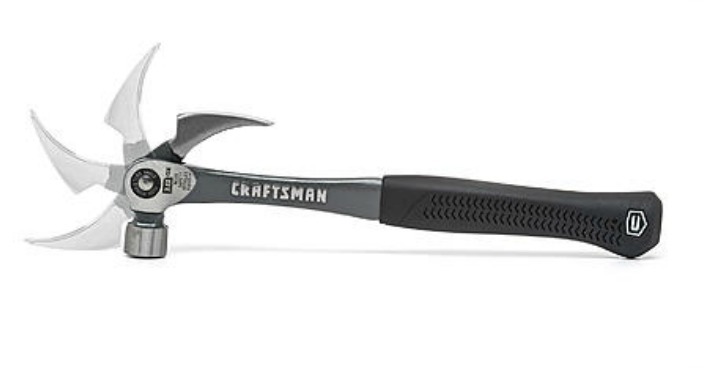 You are here: Home / Great Deals / Craftsman 18 Ounce Flex Claw Hammer Just $19.99! Sears has this Craftsman 18 Ounce Flex Claw Hammer for just $19.99! Whether you need to hang a picture frame or are trying to pry out an old nail, the Craftsman Flex Claw Hammer delivers versatility and power to the palm of your hand. This combo flex claw features two great tools in one with both an 18 ounce hammer and an adjustable pry bar. The claw has 4 different locking positions, so you can customize your leverage depending on the job at hand. Hammering can take its toll on your hands quickly. To try and offset some of this, the hammer has a dual-material handle to deliver some added comfort for blow after blow. This claw hammer is versatile enough to handle simple home repairs to prying stuck nails that just won’t budge.